The CARIBOU – Care for Adolescents who Receive Information ‘Bout Outcomes – project tackles these barriers and provides solutions that aim to enhance treatment for adolescents with major depressive disorder. • CARIBOU is an Integrated Care Pathway for adolescents with depression based on the National Institute of Healthcare Excellence (NICE) clinical practice guidelines. A systematic review and quality appraisal conducted at the Cundill Centre for Child and Youth Depression found the NICE guidelines were of the highest quality. • The CARIBOU pathway was developed collaboratively with care providers, who continue to be engaged throughout the implementation process. • CARIBOU uses a measurement-based care framework. Changes in depression symptoms are measured every four weeks, and results are provided to the clinician, patient and family. This helps inform treatment decisions. • Through CARIBOU, young people are guided through a detailed plan that includes family education, 16 sessions of group cognitive behavioural therapy and could include medication for those with more serious depression. 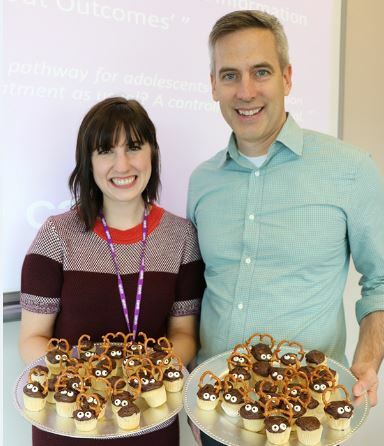 As a pilot study for a multi-centre, randomized controlled trial, CARIBOU is being compared to adolescent depression treatment as usual at Sunnybrook Health Sciences Centre. The team is considering a number of factors, including feasibility, recruitment, and tolerance of the intervention. Through a treatment pathway that is based on high-quality clinical practice guidelines, engages care providers, and includes an optimized measurement-based care framework, it’s hoped young people with depression will receive the care they need to recover.